I tried a similar product that I purchases at the beauty supply store. To say the least I was not impressed. After reading several reviews I gave in and bought the Sally Hanson version. I haven’t tried them yet (I am waiting for a special occasion, say maybe Valentine’s Day?) but I am really excited. To those of you who want to try it out I have a few pointers. Warm up the strips before you apply to make them more pliable and use the cuticle stick to “push off” any adhesive that goes past your cuticle. Good luck! I will comment after I try them out. Feel free to comment before then. *I bought the black and white hounds-tooth print! I wanted the zebra or leopard but they were sold out. *** I did apply a top coat the next day. 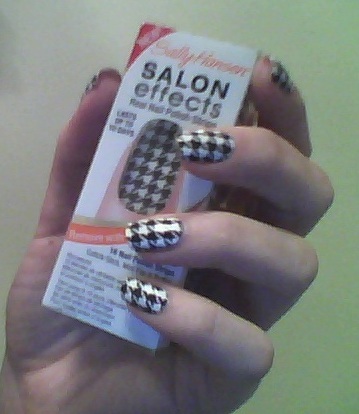 It did not affect the color of the adhesive and I do feel it will help the polish last.